Games were originally the idea of His Royal Highness, Prince Philip, as a way to encourage enthusiasm, participation and training in more young riders without the need of expensive ponies. 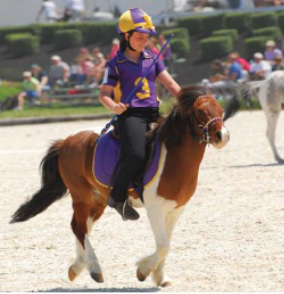 A natural draw to all levels of riding abilities, Games provides a fun mounted sport that teaches the basic natural aids, physical coordination, self confidence, and teamwork skills. It also fosters sportsmanship and the proper care of mounts to the new and younger members. The relays run the gamut from slower-paced with precision handling, to a furious pace with faultless execution. Hand-eye coordination and agility are honed by tasks like picking up objects on the ground while mounted, weaving through poles at high speeds, dunking an object into a basket at a full gallop, and passing a baton to other members of the team without slowing the pony. Games start at the Walk-Trot level. Competition at Championships begins with the Junior Division, ages 10-12. Junior Games teams vie to land a fiercely-coveted spot at the Prince Philip Cup competition. The Senior Division, ages 13-15, are more experienced games players, and some play internationally. The Advanced Division includes ages 16-18.